Lionel Page, Queensland University of Technology Business School, Brisbane; John Coates, Dewline Research, UK. In behaviour displaying the winner effect, an animal that has won a fight or a competition for territory is more likely to win its next agonistic encounter while losers are less likely. This seems to apply even when controlling for motivation and physical size. Do these winner and loser effects exist in human competitions? 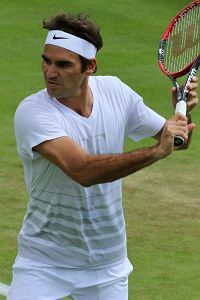 Drawing on a large database of professional tennis matches, we were able to control for players’ ability and thereby test for winner and loser effects… We found that among men, the winner of a closely fought tie-break had an approximate 60% chance of winning the second set, the loser a 40% chance. These effects did not exist among women (supporting) the hypothesis that the winner effect is mediated by an androgenic feedback loop, in which victory raises testosterone levels which in turn raises the likelihood of a further victory. … Winner effects have been observed in the business world, in, for example, tournaments for promotion, patent races, and also in political campaigns. …without knowing the science, athletes, business executives and politicians all appear to understand the importance of depriving a rival of momentum. … (a) winner effect appears to exist among financial traders, where an above-average profit raises testosterone levels which in turn increases risk appetite. …(this) may account for the dangerous and frequent phenomenon where a star trader, increasing his trading size while on a winning streak, eventually suffers losses of such magnitude that they threaten the existence of his employing firm. Access the full paper here: Winner and loser effects in human competitions.